Clive “pops” Cussler has done it again. 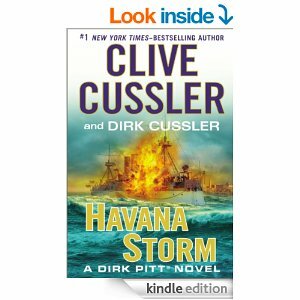 Havana Storm is a fantastic Dirk Pitt novel. As usual he has woven a maritime mystery into the plot. This time it was the explosion of the USS Maine in Havana Harbor in 1898. I was taught the incident triggered the start of the Spanish-American War. It was never proven if it was an accident or sabotage. Between the novel and some online research of my own I learned a lot about the incident and the history of the USS Maine. There were several investigations into the incident. Each one coming to a slightly different conclusion. It’s possible the sinking was an accident since the explosion happened in the forward ammo magazine. “It has been suggested by some that the sinking was a false flag operation conducted by the U.S. This is the official view in Cuba. Cuban officials argue that the U.S. may have deliberately sunk the ship to create a pretext for military action against Spain. The wording on the Maine monument in Havana describes Maine ’​s sailors as “victims sacrificed to the imperialist greed in its fervor to seize control of Cuba”, which “alludes to the theory that U.S. agents deliberately blew up their own ship to create a pretext for declaring war on Spain”. Although I an not usually one to believer in conspiracy theories, there are several things which cause me to wonder. If you had to sacrifice a ship you might as well pick one that is obsolete. The investigations into the incident could be it’s own Blog article. Wikipedia lists six major investigations have been completed since the incident. There were two done immediately after the incident in 1898. There was one done in 1911 by Admiral Hyman G. Rickover. In 1998 National Geographic did one (What took them so long.) Finally in 2002 the History Channel did one. In 1898 the Spanish inquiry concluded the explosion was caused by spontaneous combustion in the coal bunker. The 1898 joint Spanish and American inquiry said it was a mine. In 1911 the Rickover investigation was able to examine the wreckage as the Army Corps of Engineers were moving it out of Havana Harbor. They also said an external explosion (like from a mine) occurred. The 2002 History Channel investigation concluded, “that a coal bunker fire caused the explosion, and a weakness or gap was identified in the bulkhead separating the coal and powder bunkers, which allowed the fire to spread from the coal bunker to the powder bunker. The story of the ship did not end with the sinking. It turns out the ship was raised from Havana harbor, moved and re-sunk outside the harbor in deeper water. The Army Corps of Engineers did the job. They built a coffer dam around the wreck. Pumped the water out, sealed off the damaged bow from the stern and cut away the damaged bow. They filled the coffer dam and floated the ship up to be towed out to sea where it could be sunk away from the shipping traffic. I would say that’s a pretty clever solution! Cussler did a fantastic job with this novel. He used a maritime mystery where the cause was different over several investigations and wove it into his story in a very clever way. As with many Cussler novels (he is my favorite author) I give this one five stars!